The original Sun and Moon are famed for having surprisingly dark story elements that redefined how we understood beloved monsters, along with core features such as Mega Evolution. Ultra Sun and Moon take that ball and run with it. When I first read this, I didn’t get it. I thought it was a puzzle or perhaps a quest of some sort. It was only later, after I had read through more of Ultra Sun and Moon’s pokedex entries, that I understood the implications of these journal entries. Outside of the games, Hypno even has creepypasta about kidnapping children, which players have turned into playable games. So, it seems safe to assume that the Hypno in this story isn’t a babysitter or something. Hypno is kidnapping the child. Pearl: It tugs on the hands of children to steal them away. However, it gets pulled around instead. Soul Silver: It is whispered that any child who mistakes Drifloon for a balloon and holds on to it could wind up missing. Sun: Stories go that it grabs the hands of small children and drags them away to the afterlife. It dislikes heavy children. Ultra Moon: Wandering souls gathered together to form this Pokémon. When trying to make friends with children, Drifloon grabs them by the hand. With that in mind, it’s doubtful that the Drifloon picking the kid up is a pet or something. Likely, it’s trying to kill the kid. Don’t feel bad, though. Drifloon probably dies at the end of this story. It’s very easy to miss this detail, but one of the monsters that appears near the grass surrounding the school is Zorua. And what do we know about Zorua? Black: It changes into the forms of others to surprise them. Apparently, it often transforms into a silent child. White: To protect themselves from danger, they hide their true identities by transforming into people and Pokémon. Ultra Moon: If a normally talkative child suddenly stops talking, it may have been replaced by Zorua. 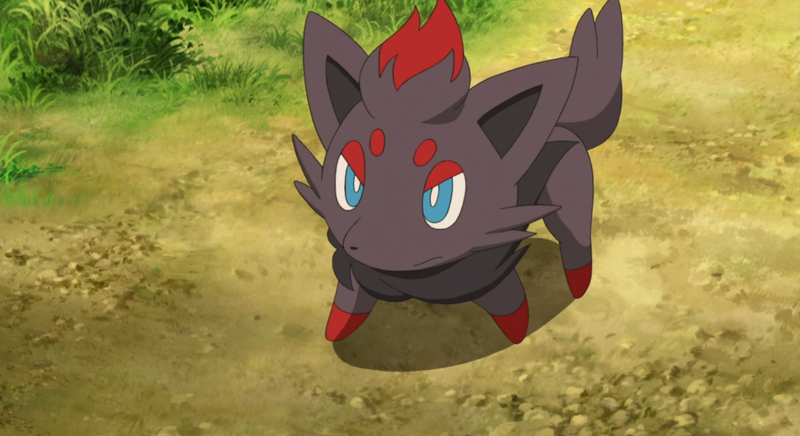 The leading theory around this small story has become that the “new kid” isn’t a kid at all—but rather, a disguised Zorua. That would explain what happened to the Hypno. Hypno is Psychic, which means it’s weak to Zorua, a Dark-type Pokémon. Drifloon, a ghost-type, is also weak to Dark-type, which is why it’s unlikely that it survives this tale. And the original kid? Well, who knows what happened to him or her. My gut tells me there’s probably no happy ending. Still, it’s hard to feel bad for the Pokémon in this story: they tried to kidnap a child, but instead walked straight into a trap. Damn. And this is just one of the many strange and disturbing moments in Ultra Sun and Moon. What the hell, Game Freak?